Spinney Country Guest House Guest HouseA former rectory set in nearly 1 acre of grounds, with views towards Exmoor, Spacious en-suite bedrooms which are tastefully decorated with freesat television and hospitality trays.Delicious breakfasts freshly cooked and served in the summer in our restored Victorian conservatory under the ancient grapevine. Warm friendly atmosphere. Parking available for 6 cars. 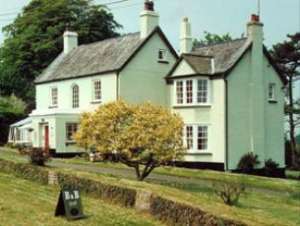 Close to beaches , beautiful gardens and Exmoor. serve breakfast, Children welcome from any age. From Barnstaple 4 miles - On A39 Barnstaple to Lynton road. Shirwell is 3 miles from Barnstaple hospital. Take a train to Barnstaple. There is a bus which will stop outside the Spinney in the morning.